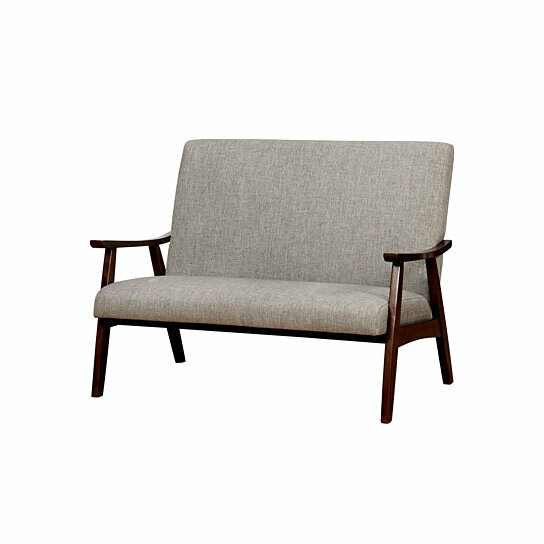 Designed with minimalist approach, this arm-loveseat will blend masterfully in your bedroom and living room interior. Made up of wood frame, its padded seating and back design making it perfect for reading and relaxing. Featuring classic style and royal sensation with brown color base and light gray color comfy fabric upholstered seat. This loveseat is highly decorated with curved wooden arms and slanted feet details. With slanted back support, the seat is more relaxed and comfortable. It will be perfect furniture item in your living or bedroom room to relax or to read books etc.